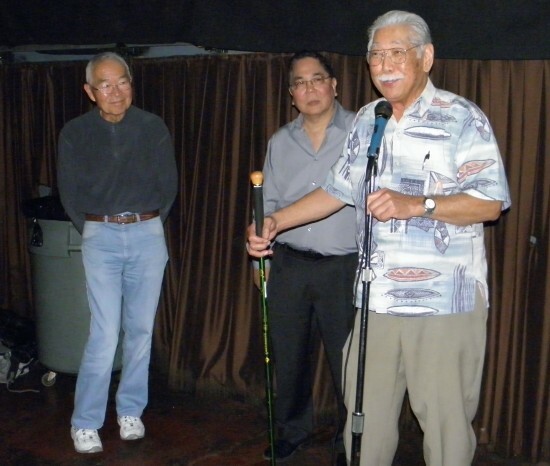 Attendees at a sold-out screening of “The Manzanar Fishing Club” on Sunday had an opportunity to meet the filmmakers and some of the people who appear in the film. The 90-minute documentary, which was six years in the making, opened at the Laemmle Monica 4-plex on Friday and runs until Thursday, April 5. It tells the story of Japanese Americans who slipped out of the Manzanar camp at night to fish in the Sierra. To get a taste of the freedom they had lost, they risked being jailed or even shot by the sentries. Producer/director Cory Shiozaki explained, “Not only did it spawn from my interest in fishing, but mainly it’s been a lifelong goal for me because my parents never told me they were interned at the camps … I guess it was a real painful experience for them. So I just learned about this when I was in college. Shiozaki was joined at the 3:10 p.m. screening by Mas Okui and Robert Kobata, both of whom appeared in the film. Okui, a retired history teacher, teaches fly fishing and frequently returns to the Manzanar area to fish. Kobata described the experiences of his father, Tadao, who went to the other side of Mt. Williamson — the second-highest mountain in the Sierra Nevada — in search of trout. Other screenings during the weekend featured others who worked on the film, including the narrators and the musicians. 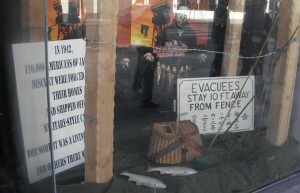 The window display for "Manzanar Fishing Club" includes barbed wire and a replica of a sign warning "evacuees" to stay away from the fence. His father can be seen in the film, posing with his fishing poles and cutthroat trout with the lake in the background. In the process of editing more than 70 hours of videotape, Shiozaki had to cut some interesting stories about camp life. He shared one of them — one that ended tragically — with the audience: A group of fishermen, part of the reservoir crew, went over Mt. Williamson. One of them, Giichi Matsumura, was also an artist and decided to spend the day painting. He asked his buddies to pick him up on the way back to camp. Matsumura’s sweater was later found. About a month later, two hikers from Independence were in the Williamson Basin, above the treeline, and spotted Matsumura’s walking stick. Then they found his body. Shiozaki has heard from experienced hikers that Williamson is even more difficult to climb than Mt. Whitney, which is taller. Showtimes are 1, 3:10, 5:20, 7:30 and 9 p.m. The theater is located at 1332 2nd St. (at Santa Monica Boulevard). Parking is available across the street. For more information, call (310) 478-3836 or visit www.laemmle.com. Fish enthusiasts may also be interested to know that “Jiro Dreams of Sushi” is playing at the same theater at 1:30, 3:40, 5:50, 8 and 10:10 p.m. Most of the audience stayed for the post-screening discussion.